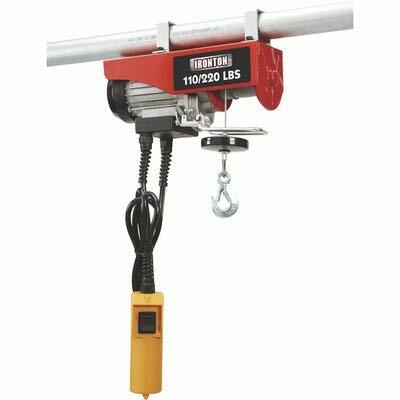 The Torin Big Red 1-Ton Chain Block provides an economical hand hoist capable of hoisting heavy-duty workloads. Load-sharing gears provide easy operation and allows you to get the job done effortlessly. This chain hoist is ideal for industrial applications. Built to meet ASME Overhead Hoists (under hung) B30. 16 standards. Zinc-plated Steel Wire, Durable Use! Handy and Convenient Remote Button! Red Butoon is emergency stop switch. For Black Button, pressing upside is going up, conversely going down. For safty reason, the hook maybe a little tense, please take if off carefully. Spend almost the same, but Free Your Hands! Not much more expensive than a manual hoist, works great but STOPPED you can squeeze the ropes together with your hand to micro move the load for assembly/disassembly work. FREE Lift Slings Included, Lift Whatever You Want! Longer 2" x 6' and shorter 36" x 2" Lift Sling Straps are Included, FREE gifts just to make your job done easier. 2 Not waterproof, can be only used indoors. 3 There is no wireless remote at present. 4 Does it reverse at the same speed for lowering - Yes, same up as down. Not so fast either direction to ensure the safety. 5 If I am using this to life a jeep top do I need anything other than what comes with the lift? - You will probably need a sling. I would check jeeps web sites for others that made there own slings. I found mine on a Porsche site but was custom fit for rhe top. 6 My hoist will not turn on. Is there a fuse or something? It is new. Can the stop button get stuck? - Stop button probably stuck. It comes with the panic button activated (red knob) twist to release and it will pop put. 7 Does the lift automatically shut off when it reaches its maximum height? - Yes. Tips PARTSam is the ONLY authorized seller of Partsam products.If you receive a product that does not arrive branded PARTSam on or not in a PARTSam packaging with logo, please contact that seller for a refund as it is a counterfeit PARTSam product. 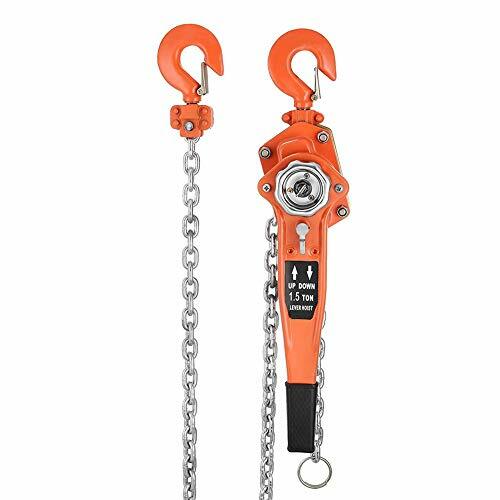 1.Convenient, hoisting power for lifting tools, equipment and other heavy items. 2.Powerful 440 LB lifting power using pulley-enabled double cable system. 3.110 Volt powered for convenient use with grounded household outlets. 4.Separate hanging control handle offers convenient control. Included Accessories: 1.Mounting clamps for attaching hoist to fixed overhead or rotating support. 2.Remote Switch , has emergency stop switch, for safe operation. 3.38 steel wire cable with sheaved pulley lift hook and weighted lift hook. 4.Stabilizing weight on primary lift hook. 5.Built-in cable guide. 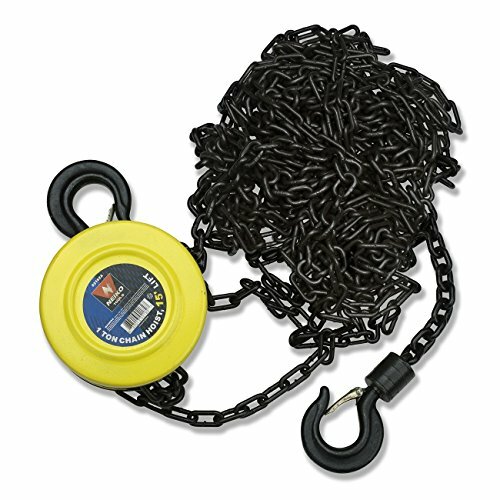 RUST RESISTANT - Katzco Poly rope pulley hoist housing is made of zinc- plated steel to resist rusting and wear and tear while in use. Heavy duty lifting made easy. That way you don't have to worry about it breaking down on you. QUALITY PRODUCT - The Katzco rope hoist includes rope made with polypropylene to ensure no fraying when in use. 2.5 housing made of steel plated with zinc and deep forged hooks and slings makes for smooth operation. Rope is also mold and mildew resistant that way everything is absolutely safe to use ensuring that you can lift safely and easily. MULTI LIFTING USE - With its 65 feet long rope, you can be sure that you can use our rope hoist at many different height levels to adapt to different work situations so lifting anything heavy from heights is easy. Can be used for lifting furniture, row boats, motorcycles, bicycles, supply boxes, and even for lifting wild game that was just hunted. BETTER ALTERNATIVE TO HAND LIFTING - People may have disabilities or back problems or just not enough strength to lift certain things. 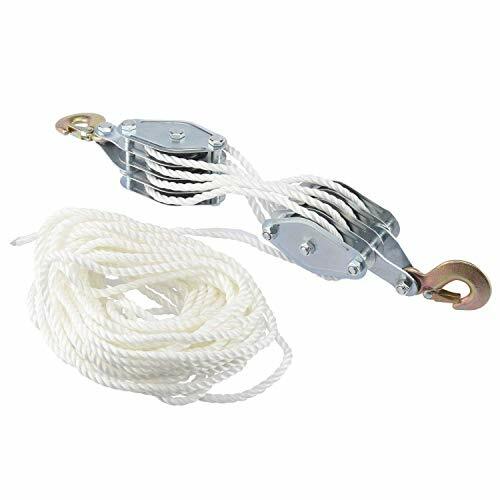 With the Katzco rope pulley the weight is lifted off of your shoulders , will allow you to lift heavier things into place with less people needed and also keep you and your back safe. Heavy lifting made easy! 15' lift. Chain diameter: 1/4". Chain material: 20MN2 premium allow steel, black oxide, heat treated. Hook: hardened, heat treated and forged steel, black oxide finish. Swivel hook with safety latchet. Gear: heat treated, forged and milling carbon steel. Cover: cold rolled steel, yellow paint. Mechanical load brake when lifting. Quality construction. Warranty: Full Lifetime Warranty due to manufacturer defect. Red Button is emergency stop switch. For Black Button, pressing upside is going up, conver going down. 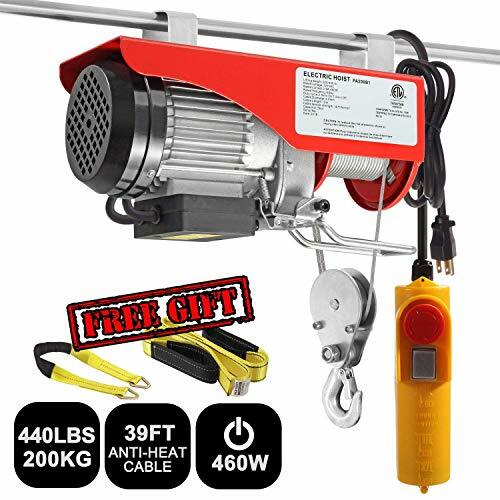 This Is Our 440 Lbs Mini Electric Wire Hoist Which Is Perfect For General Maintenance Lifting & Engine Repair. 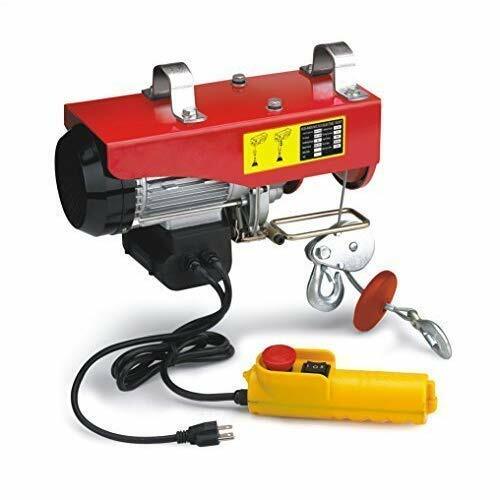 Features A Durable Braided, Anti-Twist, High Carbon Steel Cable, This Mini Electric Wire Hoist Is Perfect For Any Shop Or Automotive Garage And Loading Heavy Equipment Or Removing Small Engines. Don't Hesitate To Buy It Now! Heavy Duty And Durable High strength carbon steel line cable, braided, anti twist. Cable length of 39ft, diameter is 1/8". Rugged steel shell and mounting hanging clamp brackets, with reliable hardware, makes our mini electric wire host strong and durable enough to withstand heavy use. Sheaved Pulley Lift Hook For Dual Line Operation 2 heavy duty weighted lift hook, maximum load capacity ups to 220lbs each, 440lbs total. Lift speed of 26ft per minute of single hook, 13ft per minute of double. Max lift height of 39ft of single, 20ft of double hooks. Red Butoon is emergency stop switch. For Black Button, pressing upside is going up, converly going down. The 653 Lever is ideal for a broad range of pulling and lifting applications. Brand: Columbus McKinnon | Manufacturer: Columbus Mckinnon Corp.
2 Pack. Rugged 2.5" nylon pulley. 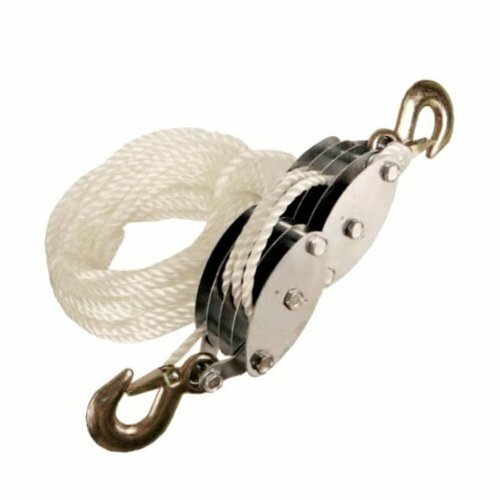 Zinc plated, drop forged eye sling hooks and clip. 65 Feet of 3/8" rope. Lifting power 7:1. 2 Ton working load capacity. Perfect for hunting, boating, etc. Zinc plated, drop forged eye sling hooks and clip. 65 Feet of 3/8 rope. Lifting power 7:1. 2 Ton working load capacity. Perfect for hunting, boating, etc. 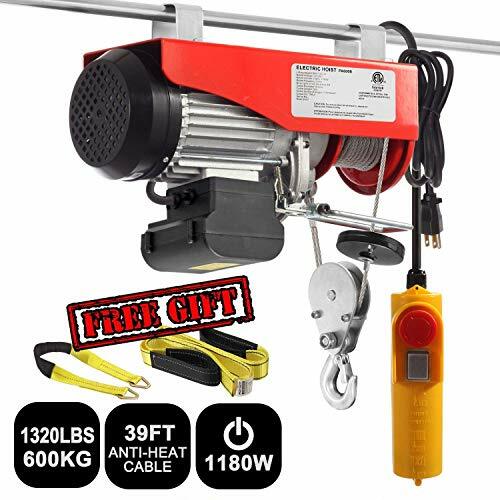 This Ironton Electric Hoist can be used to lift loads quickly and easily at the push of a button. This hoist is rated to lift 110 lbs. up to 38ft. on a single line or 220 lbs. up to 19ft. on a double line. The 0.3 HP motor delivers a quick lifting speed of 16 1/2 FPM. A heavy-duty toggle switch control provides easy operation for a 10-minute duty cycle at 25. 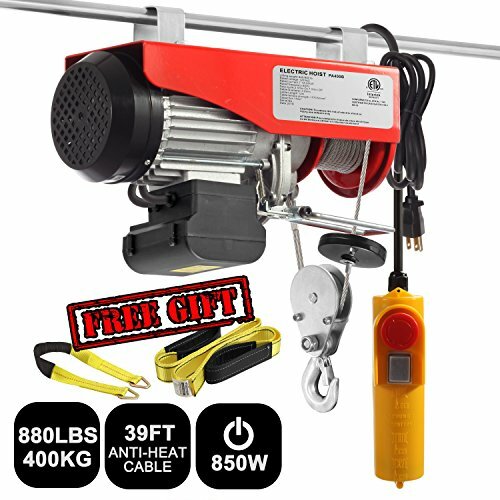 This hoist includes a 40ft.L x 1/10in. diameter cable. Advanced structured attractive appearance. 5 feet/1.5m lift. Build-in mechanical load brake. 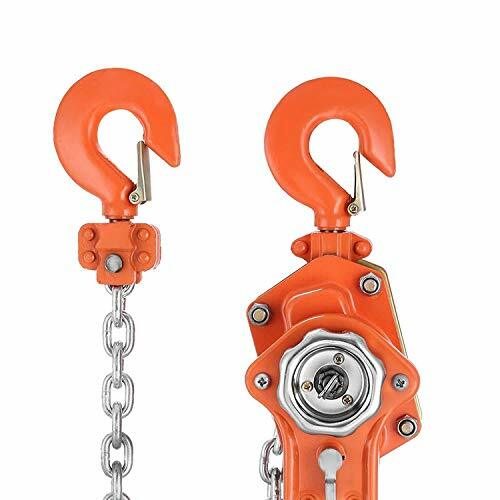 Two swivel hook with safety latches. 7.1mm diameter chain thickness. 1.5 Ton lever block hoist chain ratchet type. Constructed with hardened alloy steel chains. Come with puller pulley, gear, and two swivel eye hooks with latches Ideal for portable use in workshops, garages, factories, etc. 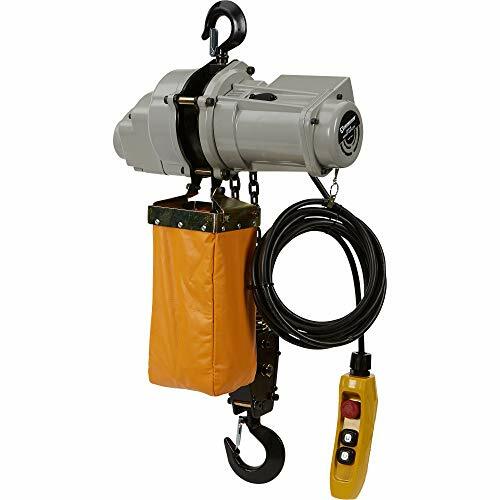 Strongway Electric Power Chain Hoist lifts and lowers loads up to 9.8 feet (3m) - all with the push of a button. 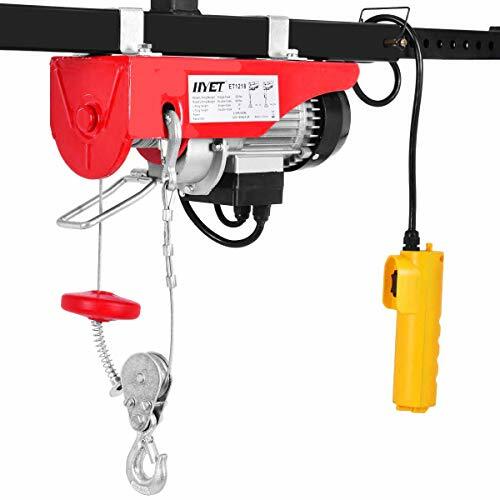 No need to climb a ladder and crank a lever with this hoist; you can remain on the ground to control operations. Enclosed steel plate construction holds a heavy-duty ventilated motor with thermal overload protection. Gear trains are permanently lubricated for long life.